Estonian Language with Instruction in Finnish on different levels according to the language skills. Scholarships available. 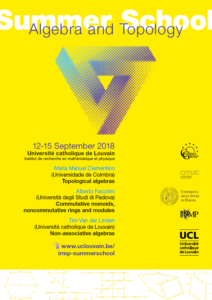 The Summer School in Algebra and Topology will consist of four intensive courses addressed to Master and PhD students, which will also be of interest to more experienced researchers in mathematics. This event is part of a joint project of UCLouvain with the universities of Coimbra, Padova and Poitiers, promoting research collaboration within the Coimbra Group. To register, please send a message to Mme Carine Baras (carine.baras@uclouvain.be) mentioning your academic status (Master or PhD student, post-doc, professor, etc.) and affiliation before 15 June 2019. She can also help you with booking a room in Louvain-la-Neuve. 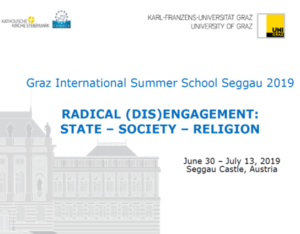 Alexandru Ioan Cuza University of Iasi will organize the 2nd edition of the JASSY Summer School (a Journey through hArd sciences, economicS, Social sciences and the tourism industrY) between 7 and 21 July 2019. Students interested in learning and acquiring credits by undertaking one of the modules on offer: Hard Sciences; Social Sciences and the Humanities; Finance and Risk Management; Strategic Human Resource Management; Tourism, are more than welcome to join the JASSY journey and to enjoy a wide range of daily field activities such as: kayaking, birdwatching, guided tours of the city trip the geographical and cultural region of Northeastern Romania. AU Summer University offers a wide variety of Bachelor’s and Master’s level courses, taught in English. During July and August 2019, AU Summer University offers 96 credit courses in culture and society, communication and media, business and social science, management and economics, psychology, law, health, natural science and technology. Each year, more than 2000 Danish and international students attend AU Summer University. The application deadline is 1 April. Find the courses and application process here. Students usually want to make new friends, go for a bike ride, explore the sights of Aarhus or join for a BBQ. Therefore we suggest that students attend the social programme, offered alongside the academic programme. 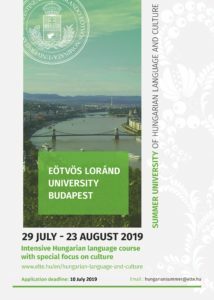 It is a four-week programme offering an intensive Hungarian Language Course with many cultural components. The Summer University brings together interested individuals from diverse geographical, cultural, and academic backgrounds for an intensive course on Hungarian language and culture in Budapest. There is a possibility to take part in the first 2 or 3 weeks of the programme with adjusted course fee. BSRS 2019 has a general focus on current global challenges and the Sustainable Development Goals, through six multi-disciplinary courses on water, climate change, migration, maternal health, cultural heritage, and poverty. An overarching aim of BSRS 2019 is to explore interfaces between research and policymaking (“science diplomacy”). Deadline for applications: 24 February 2019. Organized in collaboration with the University of Trento and Scholars at Risk international network, this intensive course addresses the many issues emerging from global dynamics that are putting at risk – or promise to transform profoundly and in unexpected directions – the very existence of academic knowledge, the roles and activities of higher education institutions, the lives and experiences of scholars and students. The Winter School particularly welcomes PhD students from non-European regions, and from low income countries and countries in democratic transition, who want to master their understanding of current challenges to the implementation of democratic principles, in times where separation and marginalisation are the everyday experience of walled politics. 4 Scholarships are available for students from such areas. 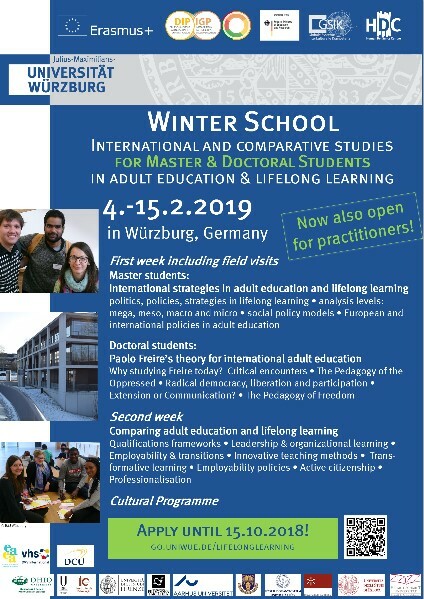 From 4-15 February 2019 the Winter School ”International & comparative studies in adult education & lifelong learning“ will take place at the Julius-Maximilian-University Würzburg, Germany. The Winter School is geared to master’s and doctoral students and is divided into a two-week programme. The Winter School is part of a blended-learning activity with a preparatory and a subsequent online phase. During the first week, there will be two separate study pathways: one for MA and one for PhD students. MA students focus on questions of international policies in adult education and lifelong learning. PhD students will focus on theories in adult education and lifelong learning. Practitioners in adult education (e.g. adult and continuing education trainers, adult education programme planners, adult education project managers) who are affiliated with the European Association for the Education of Adults (EAEA) and with DVV International are invited to participate in the Winter School. During the second week, MA students, PhD students and practitioners will work together in comparative groups on selected topics in adult education and lifelong learning. The groups will come with a policy-perspective (MA students), a theory-perspective (PhD students) and a practice-perspective (practitioners) in small groups of 6-10 participants. The Coimbra Group and the Faculty of Philosophy at the University of Novi Sad (Serbia) are delighted to invite you to take part in the International Summer School on European Multilingualism that will take place at the University of Novi Sad (Serbia) from 7 to 14 July 2018. With the support of the Erasmus+ KA107 programme, teachers from the following Coimbra Group universities – University of Bologna, University of Granada, University of Salamanca, University of Graz and the University of Poitiers (project coordinator), will propose, in collaboration with the teachers from the University of Novi Sad, an intensive short programme on European Multilingualism and Cultural Mediation Studies, with the aim to share innovative approaches to teaching and learning languages. The intensive short programme offers courses in translation and language application in several small tandem groups: German-Serbian, French-Serbian, Italian-Serbian, Spanish-Serbian. 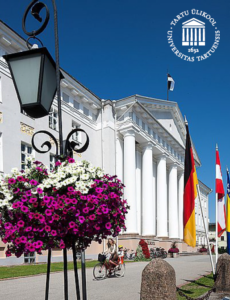 The Summer School teaching programme proposes also the Language Discovering Workshop allowing all participants to learn about the Less Widely Used and Lesser Taught languages (LWULT) and their important role in keeping language diversity and the world’s multilingual heritage. Two LWULT Workshops are offered: Hebrew and Modern Greek. The International Summer School on European Multilingualism is a great opportunity to discover the very dynamic city of Novi Sad and its cultural assets. As European Youth Capital 2019 and European Capital of Culture 2021, the city of Novi Sad, with its multicultural heritage, becomes an attractive place to start intercultural dialogue and to share the history and values from this part of Europe. One of the most exciting cultural events taking place in Novi Sad is the Exit Festival, which is the laureate of the 2018 Best European Festival Award. 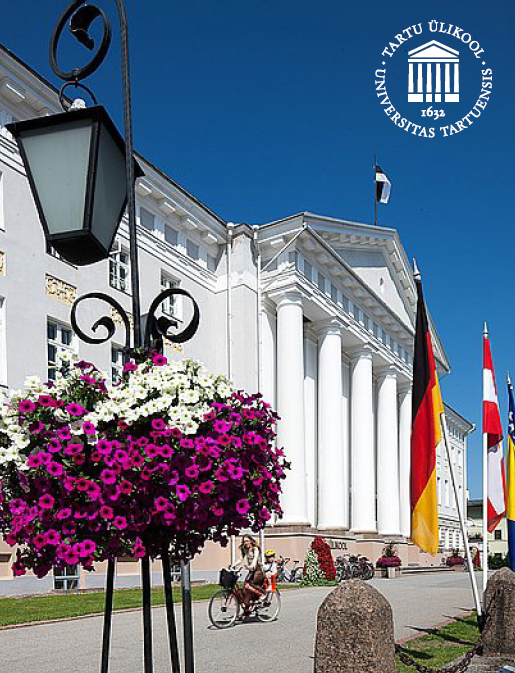 The Exit Festival – https://www.exitfest.org/sr (12-16 July 2018) is proposed as cultural programme of the International Summer School on European Multilingualism. The international Summer School will be awarded 3 ECTS. What are the student’s levels? Which are the fields of studies? 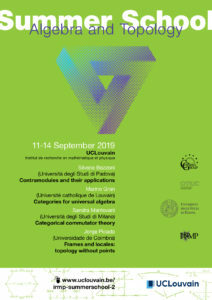 The speakers will be professors Maria Manuel Clementino (http://www.mat.uc.pt/~mmc, University of Coimbra), Alberto Facchini (http://www.math.unipd.it/~facchini/, University of Padova) and Tim Van der Linden (Université catholique de Louvain, https://perso.uclouvain.be/tim.vanderlinden/). These mathematicians are internationally well known for their scientific contributions in topology, algebra and category theory, respectively. The mini-courses will be addressed to Master and PhD students, and will also be of interest for more experienced researchers in these fields. There is a limited funding to partially cover the local expenses for students (deadline: 30 April 2018). 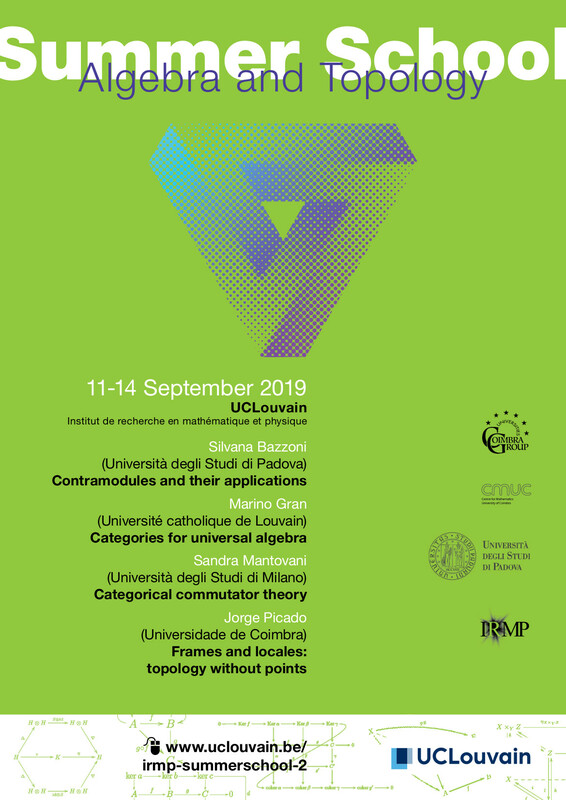 This event is part of a joint project of the Université catholique de Louvain with the universities of Coimbra, Padova and Poitiers, promoting the research collaborations within the Coimbra Group. The project is funded by the UCL for the period January 2018-December 2020.